When I wrote last about Chance needing a helmet to fix his flat spot on his head, it was July. Here we are in September and he’s closing in on actually having a helmet to wear. The helmets aren’t cheap and aren’t ordered until funding is secured. The clinic we went to suggested we try doing a pre-determination request with our insurance. Nearly two weeks later we got the answer I was expecting, “No. It’s not medically necessary.” Another call to the clinic again gave me a list of funding sources. I called a couple and after the first call I was rather discouraged. The guy basically laughed at me and told us we make too much money. I’m sorry, $2,800 is quite a chunk for people who work hard and have good jobs to come up with all at once. But, where there is a will, there is a way. 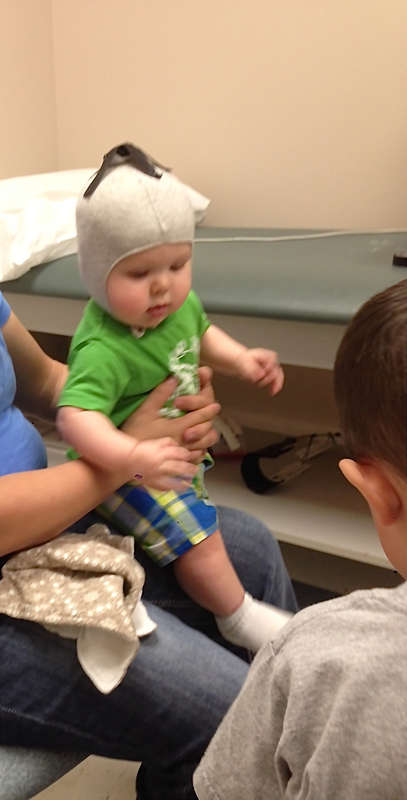 A week ago we took Chance back to the clinic in Wichita to get “casted” for a helmet. The process involves a cap with sensors that is connected to a computer. An orthotist then scanned his head using a “gun” – much like what they use to scan items in a store. The scan sent information into a computer program and wha la, there’s a 3D model of Chance’s head on the computer screen. From this they make the helmet for him to wear. When faced with the option of what color to get Chance’s helmet in, I was drawn to the camo. He’s a little boy, and what mother of a little boy doesn’t gravitate towards camo? My husband wasn’t as keen on the camouflage as I was, so we opted for a solid color. Then it was a choice between white or black? Creative parents huh? I questioned the orthotist as to what we could do to the helmet to spiff it up on our own. Stickers were completely acceptable. Well there you go. Chance will have a half Oklahoma State Cowboys and half Kansas State Wildcats helmet! He may not know the difference between the teams or even if they exist, but people will know his parents are college football fans! At least when people stare (and I know they will) they will have something interesting to look at! Chance waiting to get scanned for his helmet while big brother entertains him.